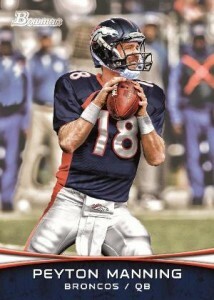 It didn't take long for Topps and Panini to catch Tebowmania again. 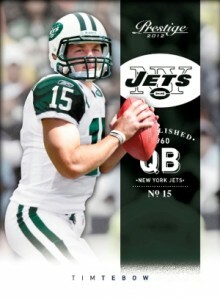 Both companies have already created mockups for their first cards of Tim Tebow in a New York Jets uniform. 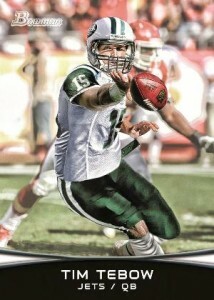 Topps will debut their first Tebow Jets card in 2012 Bowman Signatures Football. Panini has Tebow tapped to wear green for the first time in 2012 Panini Prestige. Both sets are scheduled to come out in May. Under the bright lights of Broadway, collectors can expect an even bigger spotlight for the young quarterback. There's already talk of a quarterback controversy as Tebow is expected to challenge Mark Sanchez for the starting quarterback spot. 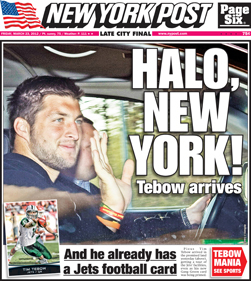 And while Tim Tebow Jets jerseys are already being sold, fans may want to hold off. Reebok's deal to produce jerseys ends shortly. When Nike takes over, there are rumblings that they might overhaul the design. So those that buy early may not match the jersey that Tebow wears when he takes to the field for the first time in New York. When the Denver Broncos signed Peyton Manning, it launched a domino effect that sent Tebow east. 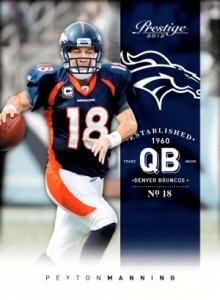 Topps and Panini were also quick to deliver images of cards showing Manning as a Bronco. 2010 Bowman Sterling TIM TEBOW Jersey Denver Broncos Florida Gators Rookie Sp!